Tea Party [recipes] – Cin Cin, Let's Eat! Back in 2006, I hosted a tea party for my friends. The menu consisted of items you would see on an English high tea service menu, such as scones, varieties of finger sandwiches, mini cakes and fruit tarts. 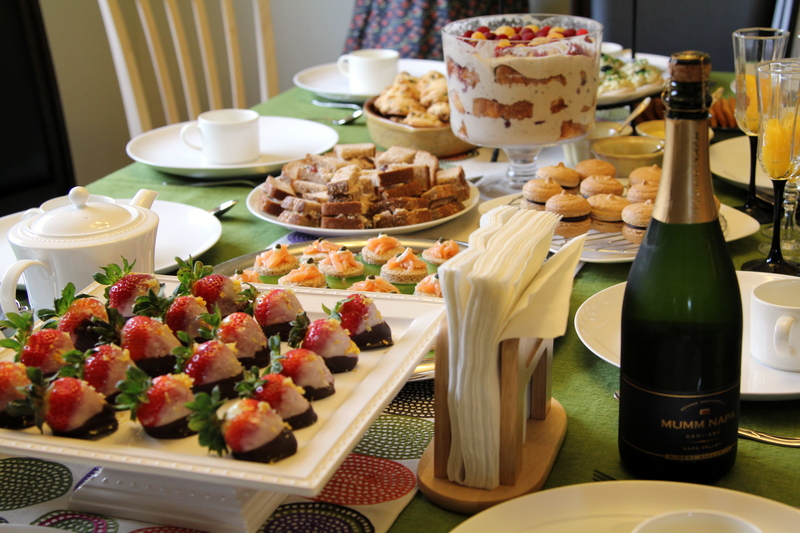 A few different kinds of tea were served as well as Mimosas and Bellinis. I spent about a week doing researching and menu planning, and about two days to cook and bake. It was definitely tiring, but I enjoyed every second of it. Pretty soon, the tea party became an annual event at my house, although I think I skipped a year or two, as I counted this year will be the 4th. But every year I find myself working cleaner and more efficient, resulting in finer products and better presentation. My 4th tea party took place this past rainy Saturday. 11 in attendance, including my 10-month-old baby niece. I try to keep the guestlist around 10 people as one year we had 16 sitting around a table that fits 10, it was really uncomfortable for everyone. I had high tea at the Mandarin Oriental in Las Vegas in April, and this was the presentation they did on their smoked salmon sandwiches and I really loved how sofisticated they looked. 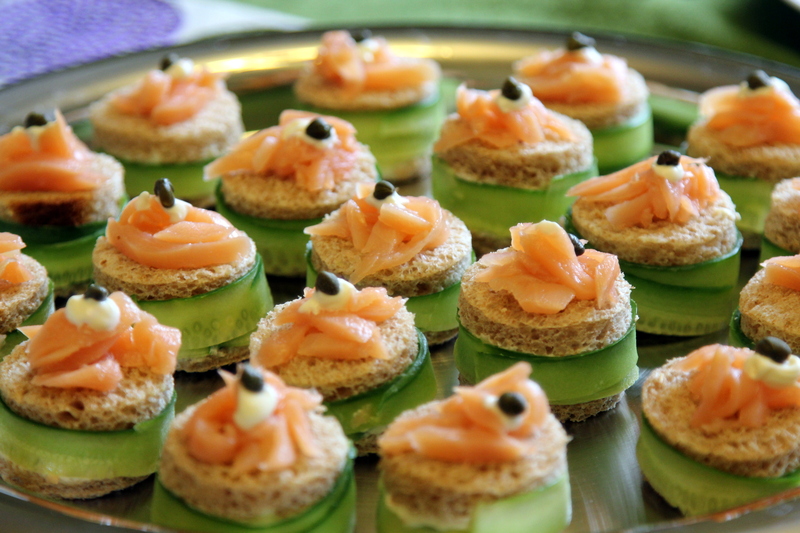 If you don’t want to go through the hassel of making your sandwiches look like this, you can simply put the smoke salmon and sliced cucumbers inside the sandwiches, cut off the crust and serve them in square, rectangle, or triangle shapes. 4 oz smoked salmon slices. Cut in thin strips. * Reserve 2 tablespoon of creme fraiche. Mix the remaining cream fraiche with softened cream cheese in a medium size mixing bowl. Whisk until well combined. Refrigerate for 30 minutes. * thinly slice the cucumbers with a vegetable peeler. * spread two slices of bread with the cream cheese mixture. Only layer one piece of bread with cucumber slice. * Using a 1.5 inch cookie cutter, cut out as many circles as you can. I managed to cut out 3 or 4 circles from each slice of bread. * If needed, cut the cucumber slices in half, lengh-wise, making them ~1/2″ strips. Wrap around the sandwich. Use two slices to overlap one another if needed. 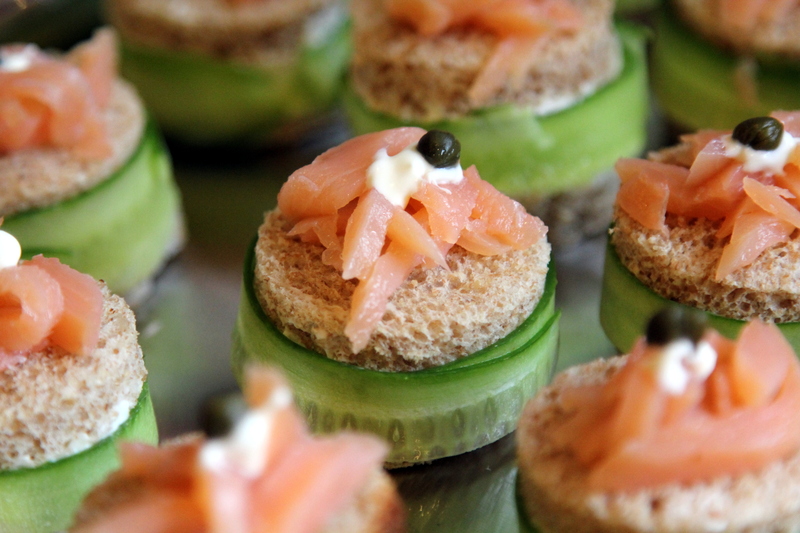 * Top the sandwich with smoked salmon strips, dot with the reserved creme fraiche and finish with a caper on top! **You can use any type of cucumbers. Although certain types have bigger and tougher seeds that you should remove. Certain types have tougher skins. I like using smaller size cucumbers like the Japanese cucumbers, but they’re not long enough to wrap around the sandwiches so I had to overlap two slices together. * Using a round cookie cutter (I used a 2″ cutter), cut circles out of the bread. You’ll probably have enough egg salad to top 30-40 circles. 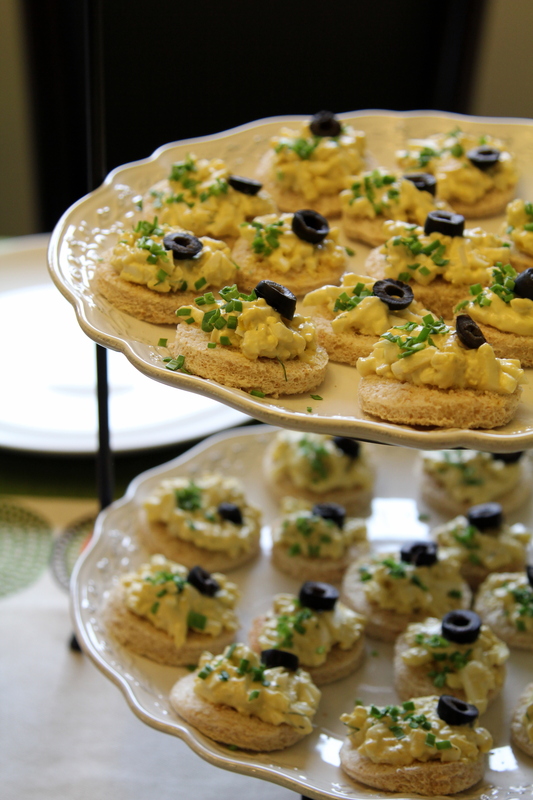 * Top the bread circles with egg salad, garnish with chives and an olive slice. This was a recipe from Bon Appetit Magazine. It used white chocolate only, but during the melting process, I over heated the white chocolate and it turned “doughy”. I had to rescue it by mixing it with hot heavy cream, turning it into almost a ganache. Because the white chocolate ganache is not setting quickly, I decided to coat the bottom of the strawberries with a dark chocolate, making them a “tuxedo” pattern. I am attaching the original recipe here. * Using fingertips, mix sugar and citrus peels in a small bnowl until sugar is moist. 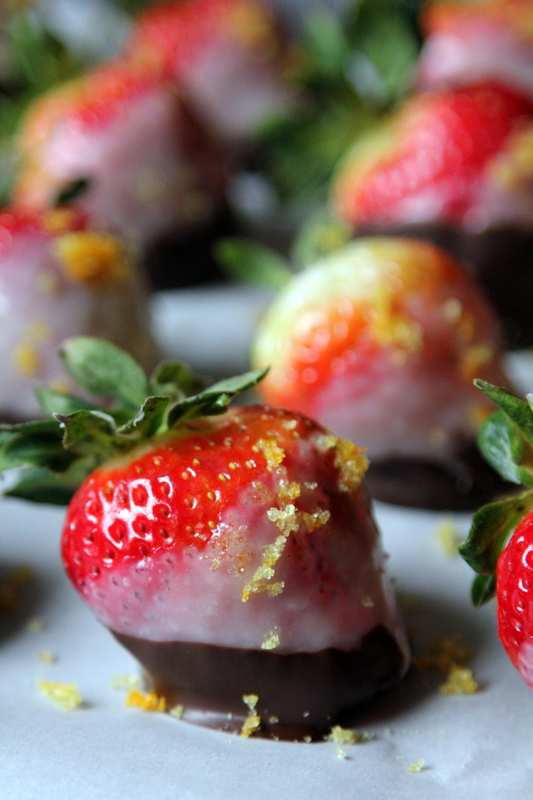 * Holding 1 strawberry by stem end, dip 2/3 of berry into chocolate; shake excess back into bowl. 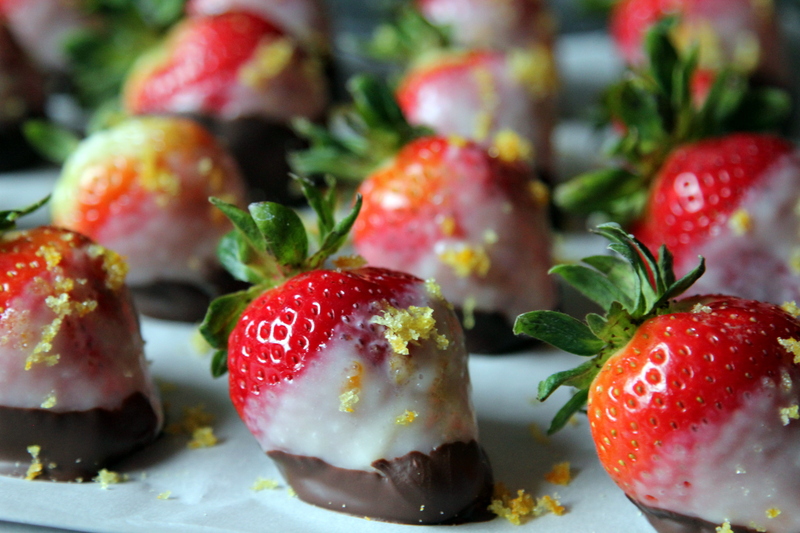 * Turn berry dipped end up and sprinkle with citrus sugar. Place on prepared sheet. * Repeat with remaining berries, chocolate, and sugar. Chill until chocolate sets, about 30 minutes. **Tips: I find that the moist sugar was hard to sprinkle. I would recommend making the citrus sugar a day ahead, and it’ll become dry and easier to sprinkle the next day. **Tips: If you botched your white chocolate like I did, simply heat up a few ounces of heavy cream until simmering, pour over the white chocolate, let it sit for a minute, then whisk until smooth. It will not set hard like chocolate, but maybe you can turn your dish into a fondue type dish, where your guests can dip the strawberries themselves. The recipe for the banana custard cream was from the French macaron class I took at Sur La Table, it was a filling for the banana macarons. I thought the consistency of the custard was a little bit too thin and liquidy to fill macarons, but it was really tasty. I love how there are actual mashed bananas mixed in the cream, not just slices of bananas. I decided to fold in some whipped cream and use it in a trifle with fresh raspberries. Pretty delicious overall, but the taste of raspberries slightly overpowered the banana, next time I will use strawberries instead. * In a medium mixing bowl, whisk yolks and egg until smooth. In a separate small mixing bowl, mix 2.5 oz of sugar, cornstarch, and salt in a small bowl. Add sugar mixture to egg mixture and whisk until smooth. * In a medium saucepan, heat milk, butter, and remaining 2.5 oz of sugar to a simmer, whisking to dissolve sugar. Pour milk mixture in a slow, steady stream into yolk mixture while whisking constantly. Return milk and egg mixture to saucepan to cook,whisking constantly, until it thickens and begins to boil. Allow mixture to boil for 30 seconds whisking constantly and rapidly to smooth out any lumps and eliminate any raw starch taste. Remove custard from heat and strain through a fine mesh strainer into a medium mixing bowl. Set bowl of custard in a large bowl of ice water and stir constantly with a spatula. * Once the custard is cool, mash the bananas and pass them through a sieve. Mix the mashed bananas with the custard. If you mash the bananas too early, it will turn black. * whip the heavy cream with 1 tbsp of sugar until soft peak forms. Fold the whipped cream into the custard until combined. * Press plastic wrap directly on surface of custard. Refrigerate until cold, at least 1 hour. * Mix the jam, lemon juice, lemon zest, liqueur together. If too thick, add a little water to thin it out. * slice up the cake. 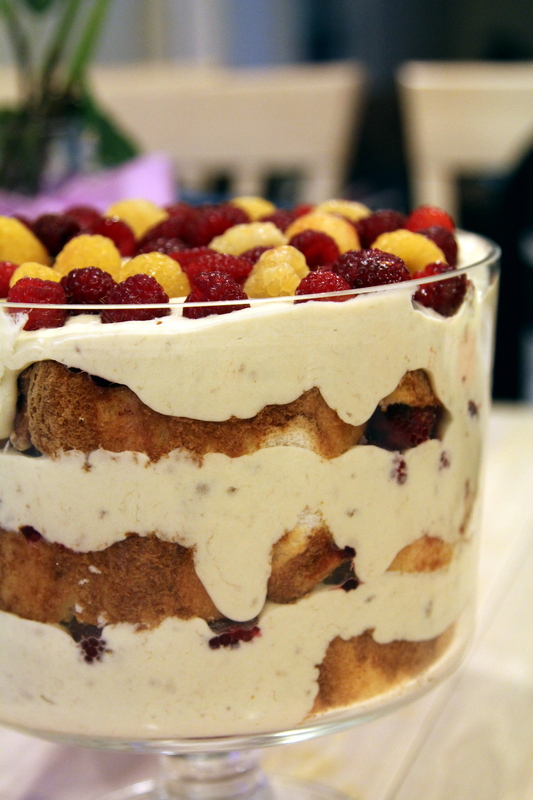 * the order of the layers in a glass trifle bowl – cake, jam, custard, raspberries. You should have enough to repeat two more times. This is another recipe I have collected from Bon Appetit magazine. I happen to have lavender honey from our trip to the Alii Kula Lavender Farm in Maui. This is a really good recipe, although you can’t really taste the lavender that much. I also didn’t have my madeleine pan, so I used another type of mold, which worked out pretty well. * Butter each madeleine mold in pan and dust with flour, tapping out excess. * Melt butter in a medium skillet over medium heat until it turns golden brown, stirring often, 3-4 minutes. Set browned butter aside. * Using an electric mixer, beat egg whites, sugar, all purpose flour, and almond flour in a medium bowl until blended and smooth. Beat honey into batter. Add browned butter, beat to blend. * Spoon 1 tbsp batter into each prepared madeleine mold. Bake until tops are just dry and tester inserted into center comes out clean, about 12 minutes. 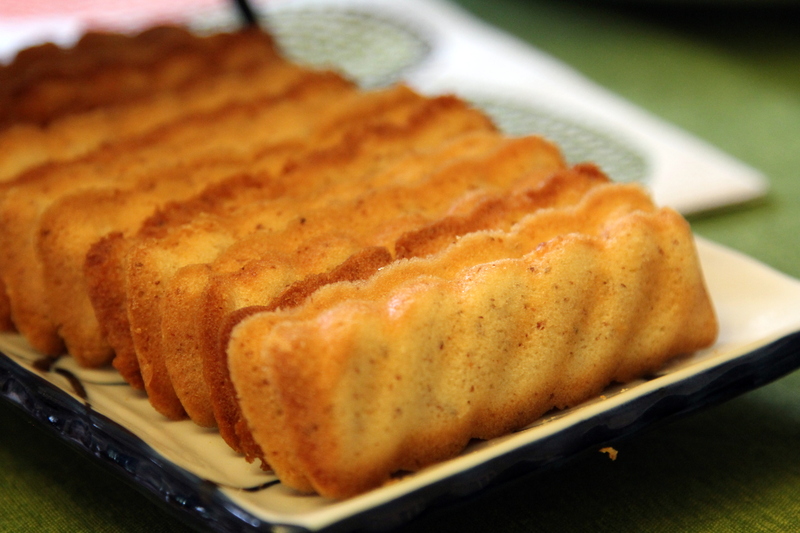 Cool 5 minutes, and gently tap madeleines out of the molds. Place on rack to cool slightly. * To prepare for additional madeleines, wash pan and cool completely. Butter and flour molds and fill as directed above. Serve warm. i love this time of year when the annual tea party takes place. this year was exceptional… presentation, taste… all perfect!! more cucumber and smoked salmon sandwiches PLEASEEEE! Um, WOW! What an awesome, amazing, over-the-top, crazy good, pick your flattering adjective spread! So delish!! Thanks, Chef Emily! 😀 Total feast for the eyes and the belly! 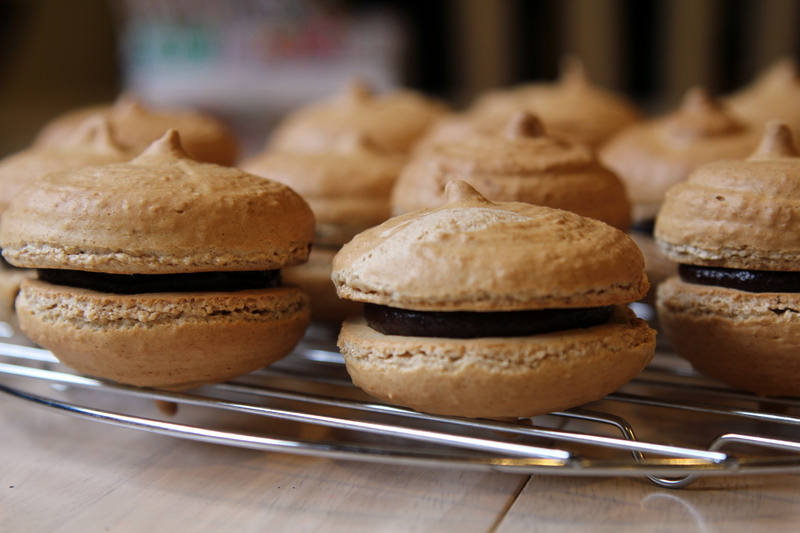 Pingback: Mastering French Macarons [recipe] | Cin Cin, Let's Eat! Pingback: Strawberry Pancakes [recipe] « Cin Cin, Let's Eat! Pingback: Tea Party 2012 [recipes] « Cin Cin, Let's Eat! Pingback: Tea Party 2013 [recipe] | Cin Cin, Let's Eat! or the power of creatine, we’ll give it all to you in our Just – One supplement and the effects are amazing. discuss with your physician before taking any type of testosterone booster. type, safety, high efficiency of the food and animal feed mould inhibitor.